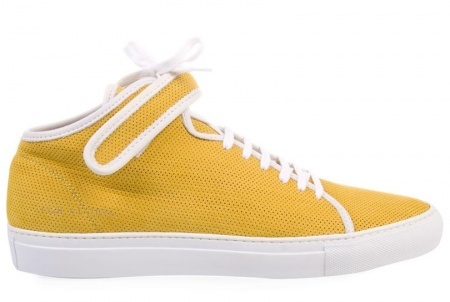 Common Projects – Yellow Mid-Top Sneakers | Definitive Touch - Men's Contemporary Style. These Yellow Mid-Top Sneakers from Common Projects come in bright yellow calf leather, with contrasting white trim and sole and a velcro fastening over the laces. The leather features tiny perforations all over the surface.